29,637 Bookings for Whatcom County Jail covering the 4.5 year period from 1/1/2011 to 7/1/2015. 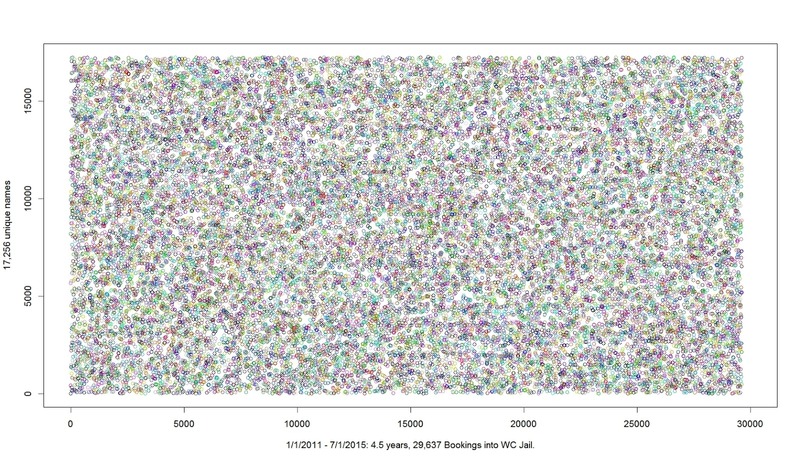 The vertical axis represents 17,256 unique names. 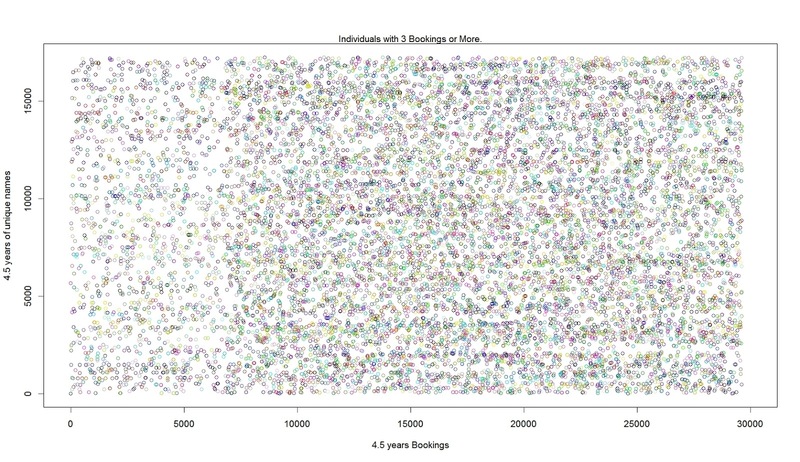 5,314 of those unique names had multiple bookings for the period with a range of 2 - 22 bookings per individual. Each unique name receives a random color for their bookings. See an animation of this chart here. See R code here. 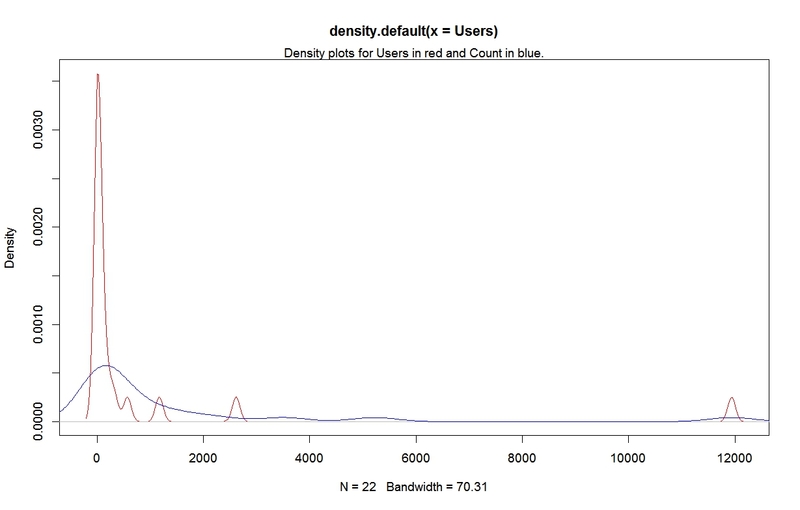 See notes on data/methodology at end. Click on the Charts to enlarge. This post discusses recidivism in Whatcom County jail. Recidivism is a primary concern for law and justice and citizens. The bottom line on 'recidivism' is this: so many re-offend at such high rates that some criminology professors fundamentally doubt whether imprisonment has any significant effect on prohibiting crime. Literature on this subject is abundant[1,2,3,4]. Some of us have come to the conclusion that imprisonment itself is the primary cause of recidivism; a counter intuitive analysis that has little political chance of wide scale adoption. 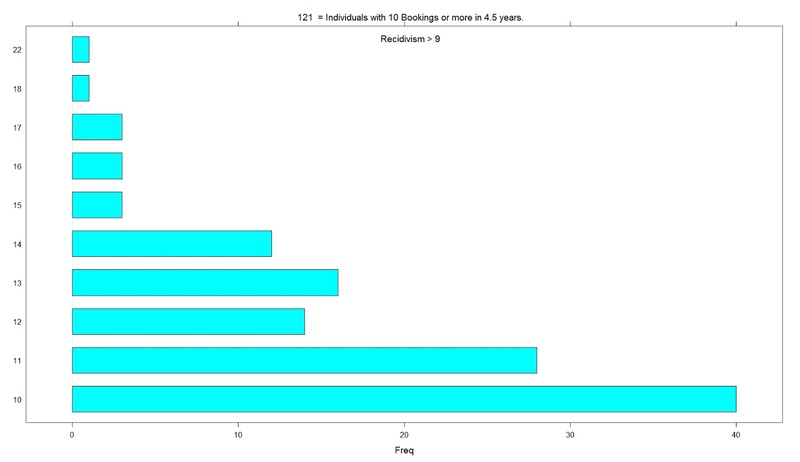 I am looking at 'booking recidivism' or booking 'return buckets' in Whatcom County over the 4.5 year period from 1/1/2011 to 7/1/2015. (e.g. 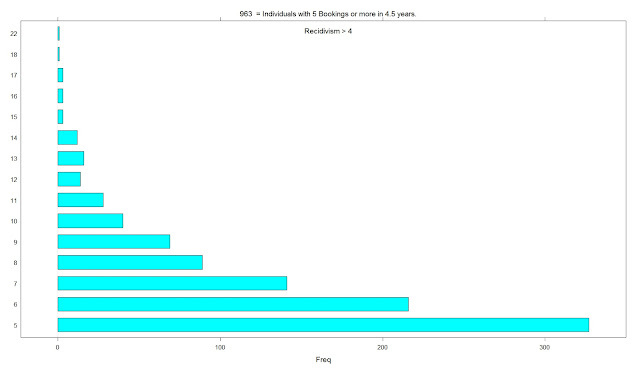 How many times a user is "booked" in that period. For this definition of recidivism, I am counting multiple bookings or returns to jail per individual (user). These aren't necessarily convictions. What I describe are 'return buckets' to our jail. 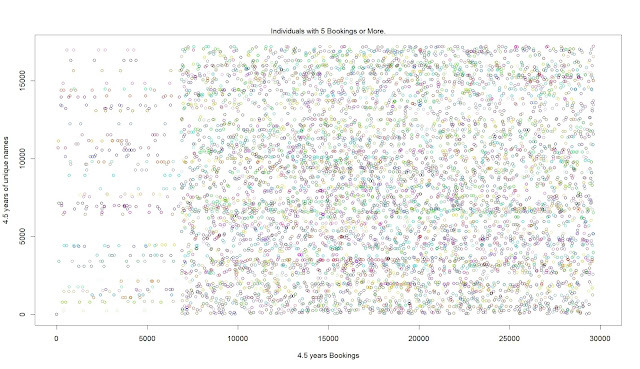 Here are granular views at the 'return buckets' by user booking counts for these 4.5 years. Click to enlarge chart. 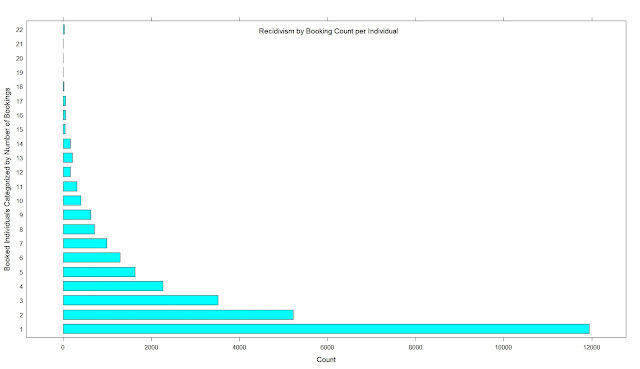 Above: Chart of data table below showing of bookings per 'return bucket' (e.g. 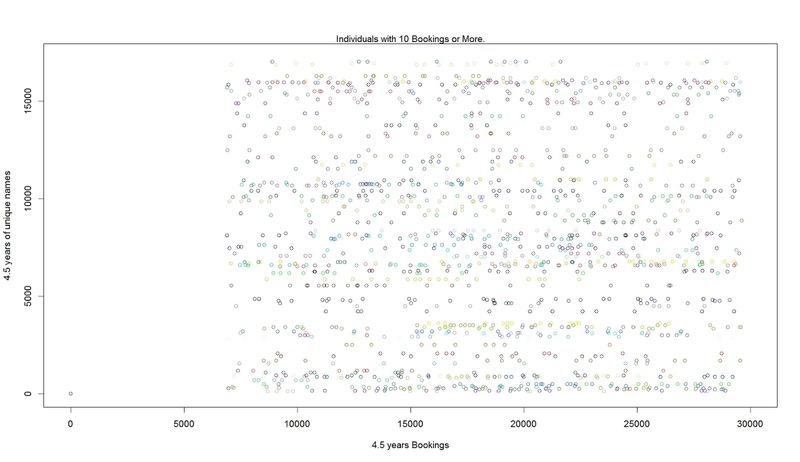 'bookings count'/ unique individual for the 4.5 year period). Below: Data table showing number of Users @ booking Number/per user with product of Users and Number (User * Number) = Count of total bookings. Far Below: Density plots for Users in red and Count in blue. 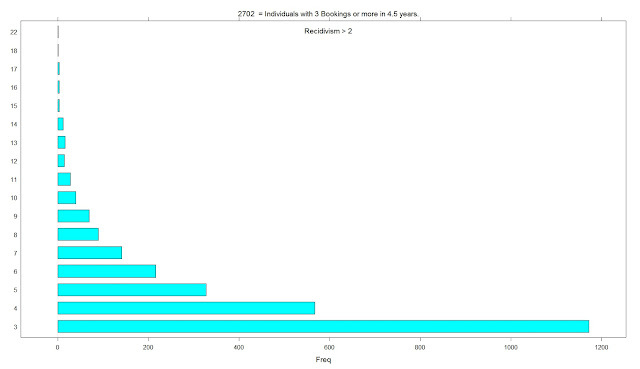 The tables below show that Whatcom County books the equivalent amount of 2% or more (1 out 50!) of its own population each year. (See column Unique.TotPop) In the tables below, I project totals for 2015 for all fields: charge, booked, unique. To project 2015, I doubled the the half year total. For Total Population (TotPop) I added the 2013-2014 increase to 2014 to create a 2015 estimate. The table below is derived from the two tables above. 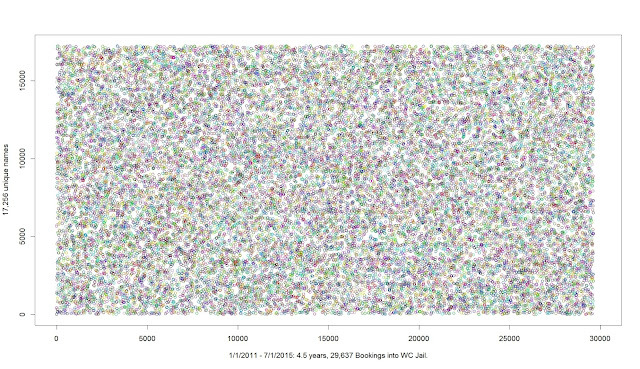 Unique numerical IDs weren't appended to the press releases until December 2013. Data may be subject to revision. For R code see here. Ryan, Thanks for the information. When looking at the total booking by Whatcom population, 2%, did you take into account that single person's will be booked multiple times? 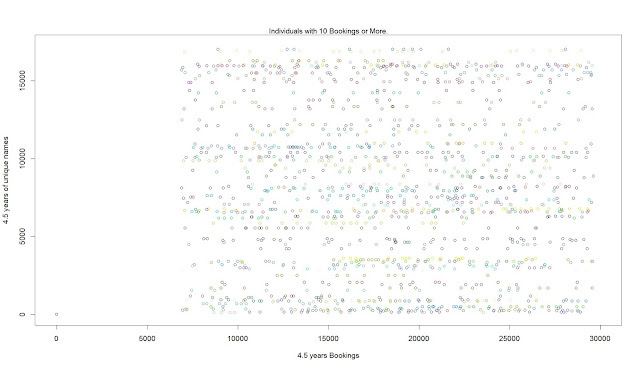 So, how many persons were booked throughout the year a single time versus more than once? I used unique.totpop for the 2% or more figure so that should be unique (unique. (firstname+middlename+lastname) / total pop). However, I created that primary key because not all firstname+middlename+lastnmes had a unique id. firstname + middlename + lastname collisions could have happened because people can share firstname+middlename+lastname. To be honest, it would be more likely with this population that the same person was named differently for different bookings. Best I could do without consistent unique (numerical IDs). Race and Incarceration in Whatcom County and WA.